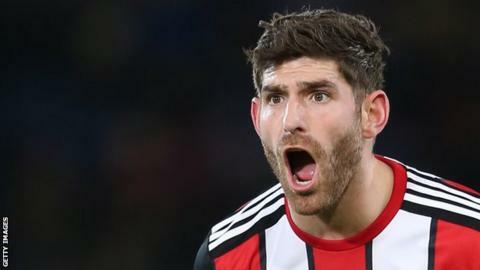 Fleetwood have signed forward Ched Evans on a season-long loan from Sheffield United, as well as midfielder James Wallace and striker Chris Long. Evans, 29, failed to score in 13 appearances for the Blades last season. Wallace, 26, joins on a short-term deal following a trial while Long, 23, had a loan spell with Fleetwood in 2016, scoring four goals in 18 appearances. "Ched's a player with great calibre and adds to our already strong attacking line-up," boss Joey Barton said. "When the opportunity came to get Ched on loan - a goalscorer who is proven at League One and the Championship - we knew we had to take it." Wallace most recently played for Tranmere Rovers last season while Long previously played alongside Barton at Burnley. "James has been here since the start of pre-season. He's every right to be in the group," Barton continued. "He has everything to prove and we want to give him an opportunity at Fleetwood to show us what he can do. "By bringing Longy in, it gives us variety in the frontline - he brings pace and the ability to play in any of the three positions at the top of the pitch."